Please RSVP here by clicking ‘going’ on the FB event, so we can get an estimated headcount beforehand! 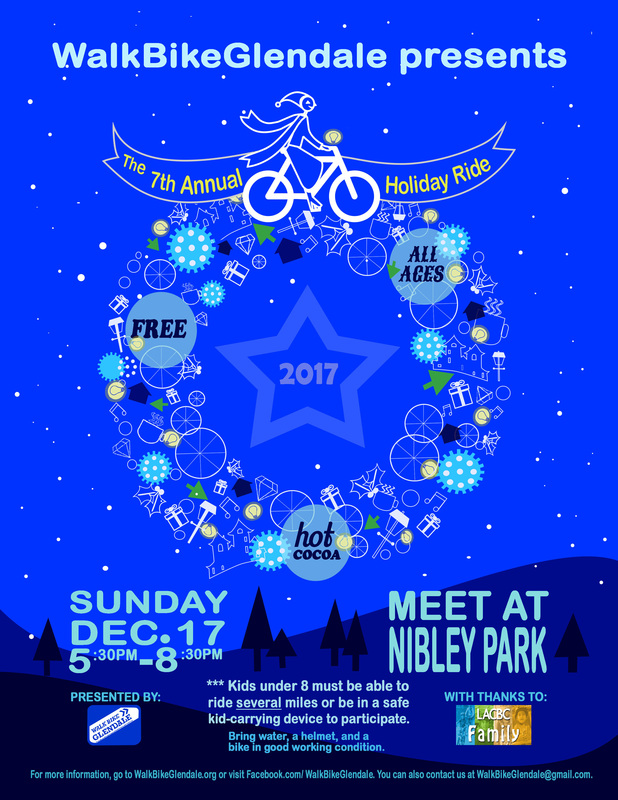 Walk Bike Glendale and Los Angeles County Bicycle Coalition – LACBC invite you to join us on our wildly popular family-friendly holiday bike ride! We will be riding at a leisurely pace for a couple miles on the quiet streets of Rossmoyne. LIGHT UP YOUR BIKE FOR THE HOLIDAYS! 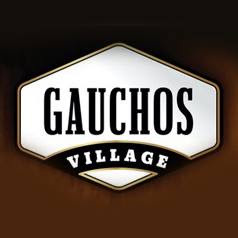 Hot cocoa and food is generously sponsored by Gauchos Village (https://www.gauchosvillage.com). Special Thanks to Gauchos Village for sponsoring this ride 3 years in a row! Kids younger than 8 should be able to ride several miles or be on a safe child-carrying device to participate on the ride. All people under the age of 18 must have a helmet to participate. This ride is a celebration of cycling and local craft beer. Your support of Walk Bike Glendale supports safe streets for everyone and improves cycling in your Glendale! The ride will start at Pacific Plate Brewery Taproom and we will ride together as a group to Brewyard Beer Company LLC. The Brewyard will be providing tours and beers will be available for purchase. The ride will be relaxed paced and approximately 5-6 miles each way. The route will be posted soon. Leave the Brewyard between 3:00 and 3:30 (feel free to stay longer). We will return to Pacific Plate Brewery Taproom no later than 4pm. Brewyard Beer Company LLC. is the first Craft Brewery & Taproom in Glendale, CA. We specialize in “Common” style Lagers A.K.A Steam Beers. These wonderful beers have flavor profiles similar to ales but still retain a lighter crisper finish of a traditional Lager. “Common” beers are a uniquely Californian Style of beer not officially recognized as a beer Category by BJCP. We also dabble with Belgian Ales, Barrel aging and release small batches of various other styles of beer that tickle our fancy at any given time. Pacific Plate Brewery Taproom is a uniquely Angelino craft brewery focusing on the fusion of Latino flavors with European Beer Tradition. Our taproom on S. Brand in Glendale offers 16 draft selections and an outdoor patio. CicLAvia traffic flows in two directions, just like regular traffic. Our 2nd Women’s Ride of 2017 was awesome! We rode out of Verdugo Park, down Glendale Ave to Wilson. We rolled past the Eagle Rock Plaza and enjoyed the long gradual climb towards the Eagle Rock Historical Landmark. The Chevron station at Colorado Blvd and N Figueroa St provided ice for our water bottles. Since the bike lane is discontinuous between Figueroa and Ave 64 we walked on the sidewalk up the 9% grade. After crossing the Arroyo and Long Beach Freeway, we headed north to the bike lane along Corson St to Allen St. We scoped out Pasadena’s new Metro bikeshare stations, which open this Friday (7/14/17). You can access this extension of the Metro transit agency network from Glendale by taking the Metro 501 Bus from the 134 fwy (Brand/Sanchez) to the Metro Gold Line station at Memorial Park. After a brief hydration/restroom stop at the 7-11 on Colorado at Bonnie, we rode through Pasadena City College to Cordova St.
We took a peek at the green bike lanes on Marengo Ave, but headed North instead to ride along Colorado Blvd (Old Town Pasadena). Since the temperatures were between 80 and 100 degrees Fahrenheit, we drank water every 15 minutes and replenished our electrolytes every 45 minutes. All the participants who started at Verdugo Park completed the 22 mile ride safely. To save money and make your own electrolyte drink, use the recipe below. Continue to follow our facebook page for announcement of upcoming group rides and walks. Walk Bike Glendale plans to host at least one more women’s ride in 2017. Until then, we hope to see you in the streets! CicLAvia is coming to Glendale and Atwater Village for the first time on Sunday, June 11th from 9am – 4pm! CicLAvia is a FREE event that transforms public streets into walk-able, bike-able, skate-able, danceable spaces for people (not cars). If this is your first CicLAvia, expect to see funky bikes and crazy costumes, as well as many regular people experiencing community with kids and pets. The idea for CicLAvia was first proposed in Bogotá, Columbia (called Ciclovía, translates as bike path) as a solution to the community’s poor air quality, poor health, and lack of open public space. The first CicLAvia was staged in Los Angeles on October 10, 2010 and the CicLAvia event called “Glendale Meets Atwater Village” is the twenty-first event of this type in LA County. Enjoy 3 miles of car-free streets, including: Brand Blvd between Doran and Broadway, Wilson Ave between Brand and Central, Central Ave between Wilson and San Fernando Rd, San Fernando Rd between Central and Glendale Blvd, and Glendale Blvd between San Fernando and Glenhurst Ave. The streets are filled with vendors and music, providing a festival atmosphere. There are 3 hubs: Brand at Doran, Central at Riverdale, and Atwater Village Glendale Blvd at Glenhurst. Hubs are where you can find bike repair stations, first aid, general CicLAvia information and merchandise, free water, food trucks, and much more. Walk Bike Glendale will have a booth at the Central Hub. We’re collecting community input for our future events. What walks and bike rides do you want WBG to organize? Stop by our booth and share your thoughts! If you’re interested in helping at our booth, you can sign up for a shift here. If you’ve never been to the Atwater Village Farmer’s Market before, this weekend will be the perfect time to check it out! There’s a FREE tote bag if you purchase fruits & veggies at participating vendors. The Farmer’s Market is in operation from 10am – 2pm. Walk Bike Glendale has been committed to providing feeder rides to other CicLAvia events. This time, the event will be coming to us. If you’re traveling from a nearby city, there is a growing list of feeder rides that may interest you. 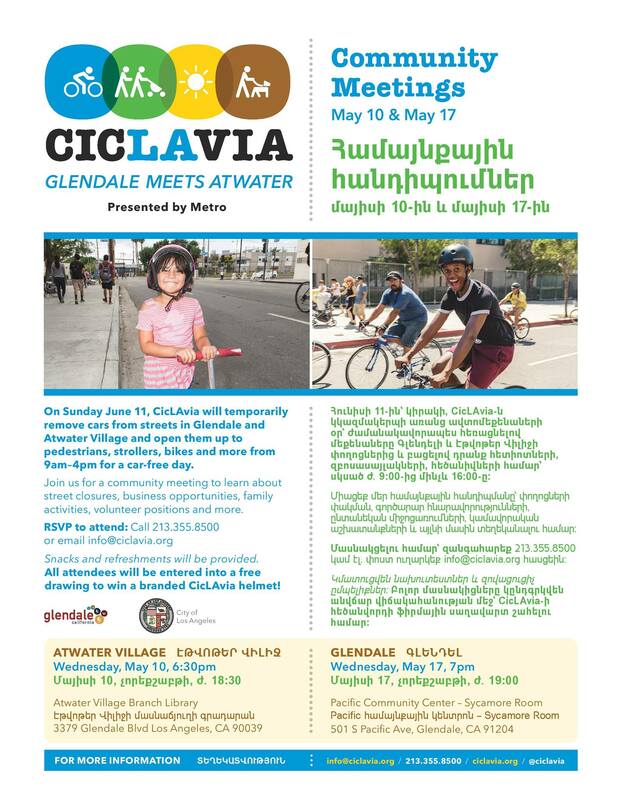 A new feature of the upcoming #CicLAvia #GlendaleMeetsAtwater is to use the hashtag #CicLAviaMoment. Take a photo at 1:00pm wherever you are, however you’re enjoying the #openstreets event. Share your photo on social media using the hashtag #CicLAviaMoment in your description. Photos will be featured on the CicLAvia website. The AARP has provided a Family Play Zone at the Central Hub and FREE PediCab rides. AARP will also be handing out Metro Tap cards to those who show their AARP membership card. So there’s something for everyone at CicLAvia. Hope to see you there! Bike Month 2017 Glendale Happenings! Dust off that bicycle and get ready to ride to work for Bike to Work Day on Thursday, May 18. 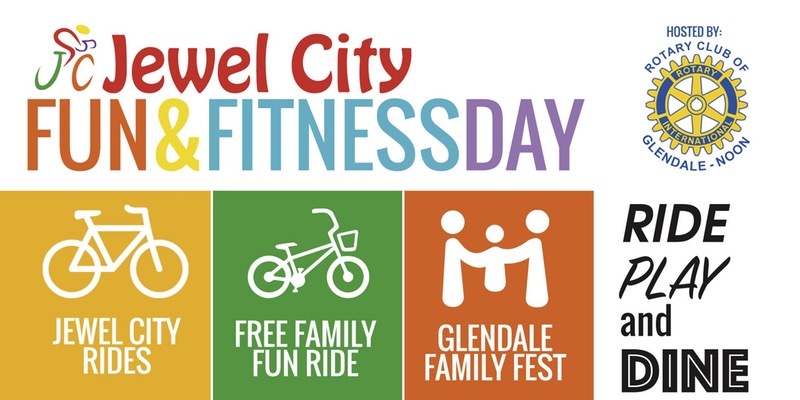 To make the trip extra convenient for you, the City of Glendale, CA, Walk Bike Glendale, and Go Glendale, have partnered to distribute refreshments and other goodies to people who bicycle to work at select pit-stops throughout Glendale! If you’ve never tried commuting to work by bicycle, Bike to Work Day is the perfect day to push that pedal. On Thursday, May 18, join thousands of other bike commuters around Los Angeles County and ride to work on two wheels. 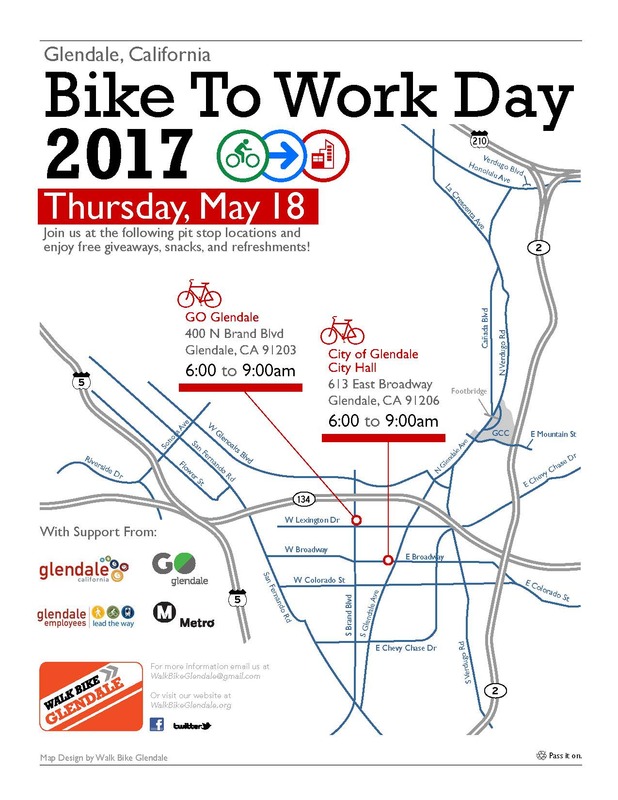 The Glendale City Council and Walk Bike Glendale will issue a ” Proclamation Designating Bike to Work Day” on Tuesday May 16th at 6:00 pm. WBG will make a brief statement on the importance and significance of Bike Month and Bike to Work Day. If you would like join WBG in making the announcement join us at the City Council Chamber, City Hall – 613 E. Broadway, 2nd Floor or email walkbikeglendale@gmail.com. Join us for a community meeting on May 17th to learn about street closures, business opportunities, family activities, volunteer positions and more. RSVP to attend: Call 213.355.8500 or email info@ciclavia.org. Snacks and refreshments will be provided. All attendees will be entered into a free drawing to win a branded CicLAvia helmet! 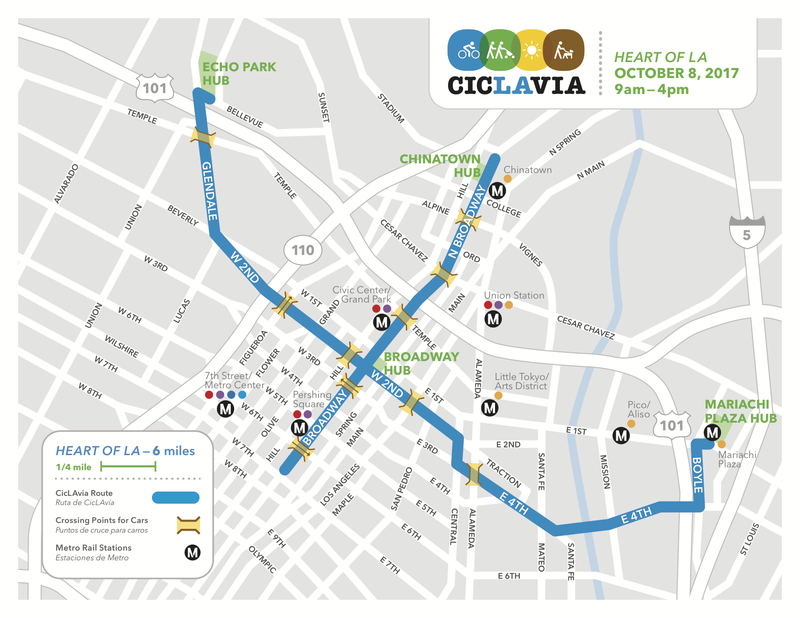 Get ready for a brand new CicLAvia route! On Sunday, June 11, Glendale and Atwater Village will host the country’s largest open streets event! Streets will be closed to cars and open for cyclists, pedestrians, runners and skaters to use as a recreational space. We are partnering with the City of Glendale to challenge the community to collectively walk 1,000,000,000 steps to encourage individuals, families, community organizations and local businesses to get out and get active. The Billion Step Challenge is a driving force in the Be Street Smart Glendale campaign to educate, encourage and empower each person to take personal responsibility for their own safety and the safety of others when walking, driving or biking in Glendale. People can share their progress and photos on social media using #BillionStepChallenge and #BeStreetSmartGlendale. It only takes three minutes to join, and there are a limited number of complimentary spaces still available. Just click Billion Step Challenge to get started and join the movement. You may link your Fitbit, Jawbone, Garmin or other compatible wireless device or smartphone app to automatically log your steps, or you can enter them manually on the website or via the mobile app for iOS or Android. People can share their progress and photos on social media using #Billion Step Challenge and #Be Street Smart Glendale. A billion steps is a long way, far enough to go once around the earth, to the moon and back – we can get there together. And remember, when you’re out walking, driving or biking, be safe and Be Street Smart Glendale! Email Walkbikeglendale@gmail.com to get a spot and be involved. Support Jenny in the Climate Ride! 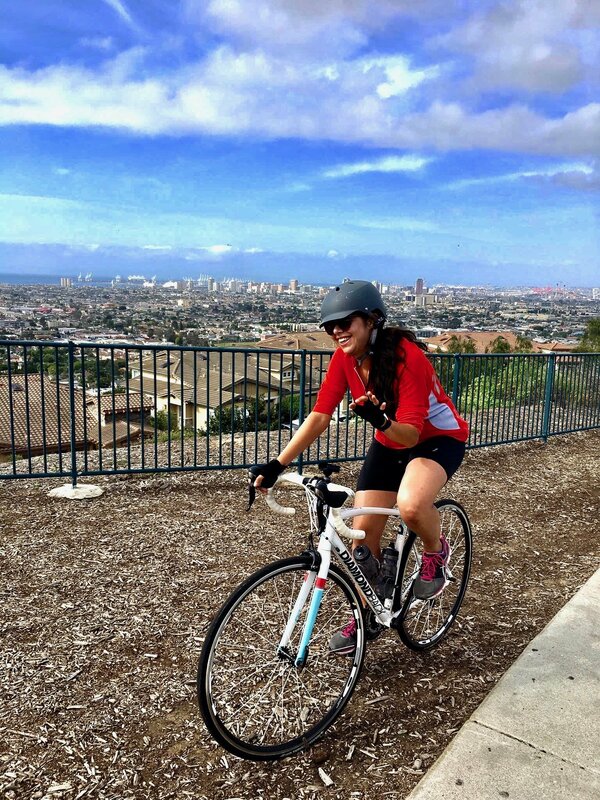 Jenny Morataya, one of Walk Bike Glendale’s steering committee members, is participating in the Climate Ride this June. She will bike hundreds of miles to raise awareness and money for more than 100 fantastic organizations (including Walk Bike Glendale and the Los Angeles County Bicycle Coalition) that are leading the nation in climate change awareness, green energy development, sustainability, and bicycle advocacy, and to raise public awareness around these issues. Get ready for bike month in May. Part of celebrating bike month is ‘bike to work week.’ Bike to work week is May 15-19th. All transit agencies will be holding special events which will be advertised on their respective websites. 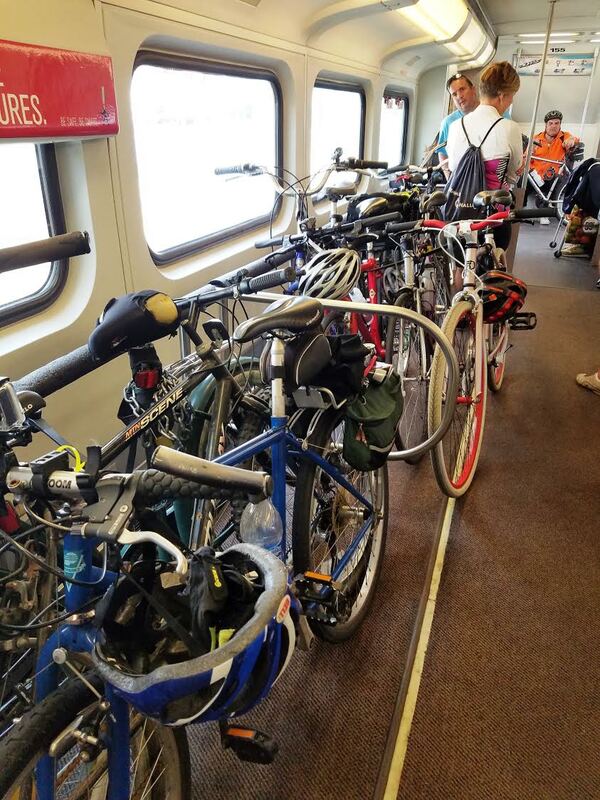 Metrolink is offering a FREE RIDE ALL WEEK to passengers who bring their bicycle on board. Yes, you heard correctly — FREE RIDE to passengers with a bicycle present — no ticket needed! Additionally, on May 16th from 5-6 pm Metrolink is hosting ‘ONE BIG Twitter Party‘ for an hour of bike related giveaways (prizes such as Metrolink tickets, bike accessories, etc.) every 5 minutes by answering bike related trivia questions. The grand prize will be an URB-E . To participate, go to Metrolink’s twitter handle (@Metrolink) and use the hashtag #pedal2work17 to join in on the party. Join us for our monthly Steering Committee Meeting! 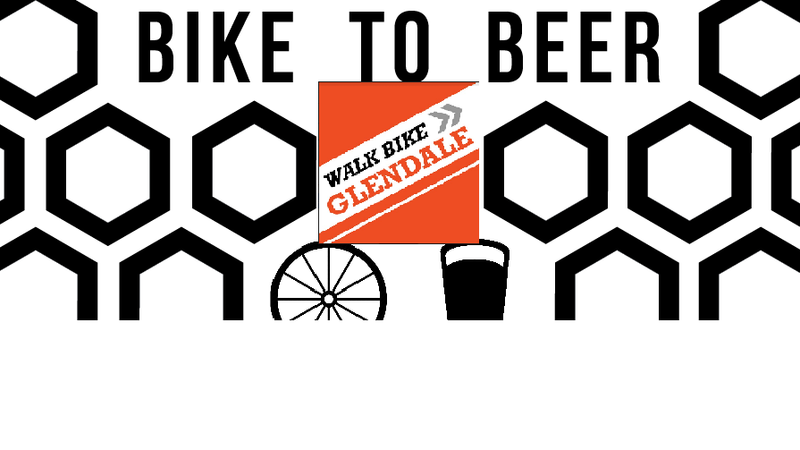 Learn about what Walk Bike Glendale is up to and how you can get involved. We have a meeting every second Monday of the month. Our monthly steering committee meetings are a great opportunity to get involved with Walk Bike Glendale. Meetings are open to the public and anyone who is interested in improving conditions for walking and bicycling in Glendale is encouraged to attend. You do not need to be a steering committee member to attend. Meetings are held in the “Sun Room” at Panera Bread on 300 N Brand Blvd from 7:00-8:30pm. Please join Walk Bike Glendale on April 29th as we walk between two of the city’s oldest and most historic structures, Catalina Verdugo Adobe andCasa Adobe De San Rafael. Our route will take us through Verdugo Woodland’s Niodrara Historic district, Verdugo Park, and the neighborhoods of Rossmoyne Historic District, and Verdugo Viejo. The adobes will be opened for us and short docent led tours will be provided. Come out to experience our city’s unique history, topography and beauty up close, while participating in a free, health-promoting activity. · 12 PM – Gather at Catalina Verdugo Adobe for tour (bring a picnic lunch if desired, and enjoy the beautiful space). 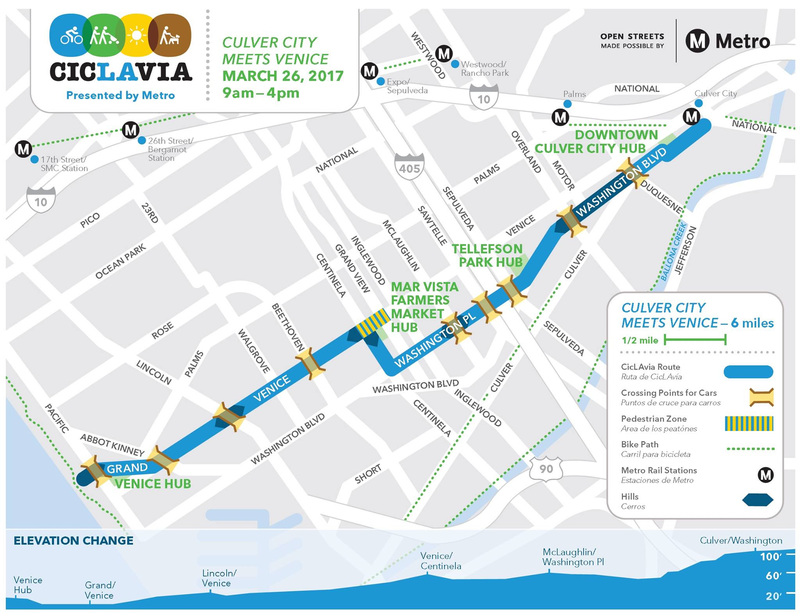 Take Metrolink and Metro to CicLAvia – Culver City meets Venice. Walk Bike Glendale will be providing a weekend day-pass for all participants ($10 value). 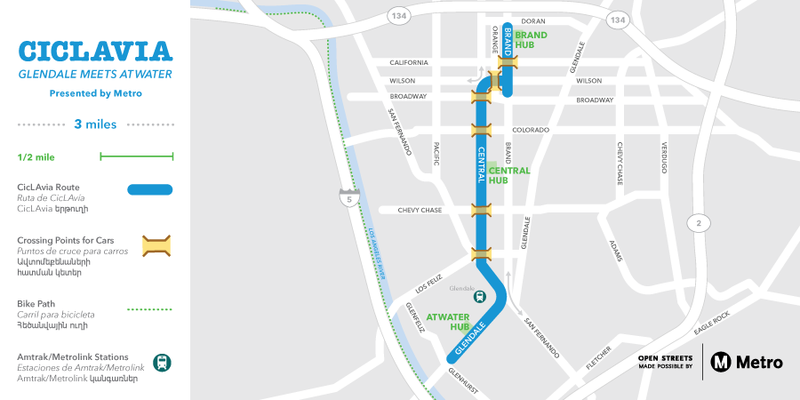 This pass will enable you to get to CicLAvia and back via Metro light rail and Metrolink trains. Tell your friends! All ages and abilities are welcome. Walk Bike Glendale sat down face to face with council candidates (including 2 incumbents) to talk about Walk/Bike issues. Make an informed discussion for the election! Walk Bike Glendale has uploaded the audio to SoundCloud. If you wish, you can listen or download (podcast). A transcript of our meeting can be seen below. All candidates were asked the same question: With this new infusion of (Measure M) transportation dollars, how do you think we can further promote walking and biking in Glendale? Mike Mohill = Like I always tell everyone, if you have an issue, go before the city council. One of my big things, in my experience with the bike lanes, is that they’re not clearly marked. I think, for example, in some parts of the city, or other places I’ve been to, they actually paint the street a different color. So that’s good for the bikers and good for automobile drivers. I also think there should be some more publicity done by your group, because you’re secret. Did you know that? You guys are secret. Most people have never heard of your organization. And that’s what I would do, promote the efforts of Measure M money. There’s the newspapers. Talk about it. Go before city council, talk about it. If you have the funds and it’s not being used, that’s too bad isn’t it. There’s one thing about government I found out: If you don’t use it you lose it. Mike Van Gorder = First of all, we got the Verdugo Wash Bike Path, I would love to see that come to fruition. A big push that they’re having right now is the South Glendale Development Plan. Transportation is a big part of that. They want to get more light rail. They’re even kicking around a trolley, which I don’t think is the best idea, unless it goes all the way to the airport, which they’re discussing. We’ve got these big wide streets, giant medians (like Glenoaks) I think we could absolutely put a bike lane in the middle of it. The streets should be multi-use. And I know they want to expand them into multi-use anyway. I see more people using bike lanes than the trolley, which seems charming and less useful. As metro expands, transportation hubs are being built in the North and Westside, which I know they really want to do. They’re spending $300,000 worth on environmental impact studying to see how these things are going to wind up. Having generous resources made available for bike racks, that would connect a bicyclist to the entirety of Los Angeles. If we can make it easy for people to bike to one of these these transportation centers, lock it up safely, something that is not easily bolt-cuttable. Then they can take off and go about whatever they are doing. That keeps less cars on the road because now I don’t need to drive to Santa Monica, I can bike/take the train there. Grant Michals = Without feeling like I’m stealing from the pedestrian safety advisory commission, the last meeting held different intitiatives. I do favor Vision Zero as an overarching goal. If we don’t state that we have a significant problem with pedestrian and cycling accidents, and form an umbrella to go ahead and figure out what can be done to meet that, then we’re lost. We need that framework. Citywide, the first thing we need to do is go ahead and state: we acknowledge there is a problem. And be able to prioritize projects and funding to address that. When we talk about some of the initiatives the “Twenty is Plenty” to establish a 20 mph speed limit, which would reduce the number of pedestrian deaths to 85% versus a much higher percentage as the speed goes up, with a chance of a pedestrian fatality in a collision. That “Twenty is Plenty” is going to take a long time to change driver behavior, education, and implement. More of the engineering projects, such as no right turns in the downtowns, is an engineering project with a much smaller cost and a much more immediate return. So when we have the money coming in from Measure M, I want to try to prioritize that to where it has the greatest impact and go after the lowest hanging fruit as well as plan for the future having an education component for the longer term. Having a full framework of everything we want rather than focusing on just one issue. Ara Najarian = Carving out a dedicated earmark for dedicated walking and biking for the local return, which comes every year, we should do that. In terms of our best play for walking and biking, is the first mile/last mile concept. Which is very much en vogue at the MTA. Which basically will fund projects and programs that will get people to and from transit. Whether that’s going to mean bike lockers, rental bikes, bike lanes, bike facilities, pedestrian-oriented development. That’s the low hanging fruit for us in Glendale to grab and to do that. LA does it like crazy. They’re getting $115M on their first mile/last mile. We should be at least be able to grab $5-10M of that for ourselves. Who: Join Walk Bike Glendale on our feeder ride to 626 Golden Streets. When: Sunday, March 5, 2017. Meet at 7:30am, roll at 8:00am. Where: We’re meeting at Glendale Central Park, 201 E. Colorado St.
What: It’s a 7 mile ride to the start of the open streets event. A map of the route + feeder ride is here. Because the route parallels the Metro Gold Line, you do not have to bike the entire 50 miles. You can buy a TAP card for $1 + $1.75 for a one-way trip OR a TAP card for $1 + $7 for a day pass. With the day pass, you could jump on and off the Gold Line (train) as many times as you like. The one-way trip is valid for 2 hours after activation. Hope to see you there! 626 Golden Streets features 17+ miles of smiles. The 626’s first multi-jurisdictional open streets event links Gold Line stations from South Pasadena to Azusa. Collect 8 free stickers (one at each hub) starting at 8am.